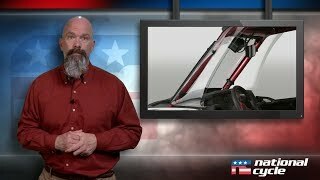 National Cycle's AirFlares™ greatly extend the coverage and comfort of our SxS UTV windshields. In addition, they are highly effective brush guards. AirFlares are made from Quantum® hardcoated polycarbonate for long-lasting scratch resistance and durability. UTV riders thrash around in dirt, mud, sand and rain. 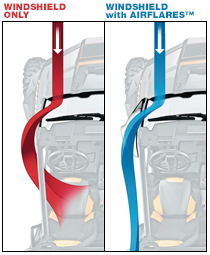 National Cycle AirFlares™ extend the comfort of the front windshield on SxS vehicles. AirFlares are side shields with a flared trailing edge that deflects and diverts a great deal of debris and moisture from curling into the cockpit. In addition, they are highly effective brush guards. For a tight fit to the frame, National Cycle engineers all products directly on the vehicle. 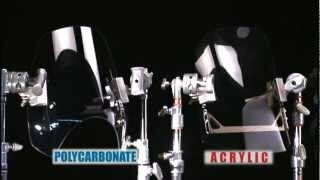 Precision CNC routing and forming ensure every piece fits the vehicle it was designed for. Installation is simple and can be done in 15 minutes or less. AirFlares mount with a secure, clamp-mount system that attaches to the frame. No drilling or alteration to the vehicle is necessary. 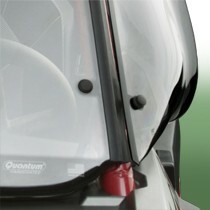 When installed, the product blends seamlessly into the side frame of the vehicle. Small details are silkscreened on the product so the finished look is first-class. Airflares are made from Quantum® hardcoated polycarbonate for long-lasting scratch resistance and durability. This is the best quality you can get, with excellent optical clarity, unbeatable strength and unsurpassed scratch resistance. AirFlares mount to the vehicle's frame with National Cycle's no-rust, snap-fit clamps. 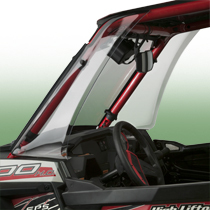 A small amount 3M® automotive tape is used to seal the upper and lower edges.